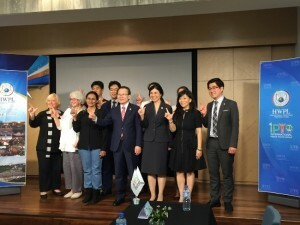 SYDNEY, Dec. 29, 2015 /PRNewswire/ — Religious leaders gathered at the Church of Scientology of Sydney, to attend an interfaith conference organized by Heavenly Culture, World Peace, Restoration of Light (HWPL), an international interfaith organization. Special guests speaker was Executive Director of HWPL, Mr. Jae-Seob Jee, who visited Australia for the first time for the conference. Mr. Jee urged those attending to work together to resolve conflicts around the world by increasing tolerance through understanding. Ms. Vicki Dunstan, President of the Church of Scientology Australia, welcomed Mr. Jee and other religious leaders and representatives and congratulated HWPL on the initiative it has taken to bring together religious leaders for their common aim of peace.